The Israel Diamond Institute (IDI) is optimistic as it prepares for the Hong Kong International Jewelry Manufacturers’ Show, November 29 to December 2, 2018 at the Hong Kong Convention & Exhibition Centre. IDI said that positive expectations are based on rising demand in Hong Kong and other Asian markets, and an anticipated increase in activity before the Chinese New Year. IDI’s Israel Diamond Pavilion will host 26 companies. 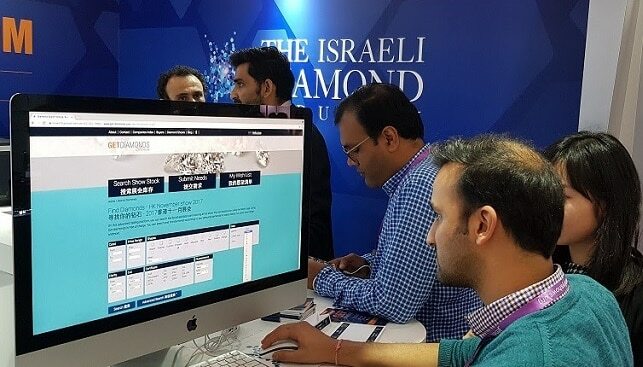 Buyers will be invited to search the Get Diamonds database in both English and Chinese for the goods they seek among the Israeli exhibitors. The Get Diamonds terminal will be positioned at the IDI information booth at 1DC14. IDI Chairman Boaz Moldawsky said that he was optimistic that this would be a good show for Israeli exhibitors. “We are seeing a positive trend in Asian markets, especially in Hong Kong, with polished diamond imports to Hong Kong rising 11% in the third quarter of 2018. The show is timed right before the holiday season so it will certainly attract holiday shoppers, both business and consumer,” he said. Organized by Hong Kong Jewelry Manufacturers’ Association (HKJMA), the show features fine jewelry, loose diamonds, pearls and colored gemstones. It attracts buyers from mainland China, Taiwan, the Philippines, Indonesia and other parts of Asia Pacific. The timing of the show enables buyers to stock up on last minute purchases before the busy holiday season. Asian markets are key to Israel’s marketing strategy, with sales to Asia representing over 30% of Israel’s total polished diamond exports. Hong Kong trade shows are a strategic focus for IDI, which organizes national pavilions at shows in March, June, September and November.